Below you’ll find Mr Sanchos Menu in all of its glory. The food and drink served here is one of the many reasons that Mr Sanchos is so well known (it actually might be the most popular shore excursions in Cozumel.) From shrimp to fajitas to burgers, their food menu will have more than you need to fill up. And wash it down with some delicious, frozen concoctions from Mr Sanchos Drink Menu, complete with margaritas, daiquiris, mixed-drinks, beers and non-alcoholic refreshments. We often get asked whether the All Inclusive option at Mr Sanchos is worth the money or if guests should opt to “pay as I go.” It’s a great question with the annoying answer, “it depends.” Luckily, the formula is pretty simple. If you think you’ll consume roughly these items or more shown below, go for the All Inclusive option. The items below represent an average of the costs for the associated items on Mr Sanchos Menu. In our humble opinion, that’s not a ton of food and drink shown above. We could put that down within the first hour at Mr Sanchos. The cost for Mr Sanchos All Inclusive is $49.95 found here. Maybe you’re not as big of an eater or drinker. In that case, you’ll want to check out Mr Sanchos menus below. Find the foods and drinks that will work for you. Remember, too, that you’re on vacation. There’s an added value to having no restrictions to think about when ordering. At the resort, you’ll find traditional Mexican dishes along with a few American items for the unadventurous types. Many people rave about the shrimp cocktail and the ceviche dishes. You’ll have the option to visit a buffet to quickly grab some of the menu items shown, or order from your waiter. It’ll typically take 15 to 20 minutes per order and you can continue to order until you’re full! Here are some user uploaded photos of food items from Mr Sanchos menu. This is where the bill can add up. It’s also the main reason we go All Inclusive at Mr Sanchos. Your bartender will happily serve up margaritas, daiquiris, cocktails, beers, or non-alcoholic beverages. Below, you’ll find the many options for both all-inclusive and “pay as you go” guests. These are the beautiful and colorful drinks you see on Instagram. If you’re going “a la carte,” you can get these in three different sizes. If all-inclusive, you’ll get them in a small, 10-ounce plastic cup as seen in our pictures. It’s been reported that these drinks are lacking on the alcohol. You’ll find a wide array of alcoholic drink options here. We’d recommend trying the Mr Sanchos special or the michelada-style drink. Some people are worried about drinks having too much sugar or too little alcohol. Avoid both issues by going the beer route. If opting for “pay as you go,” you’ll have more options than if you get the day pass. Here are a few user photos of options from Mr Sanchos Drink Menu. From the thousands of reviews about the resort and its food / drink, the vast majority were positive. People love this place! Here are a few of the higher quality reviews relating directly to food and drink. 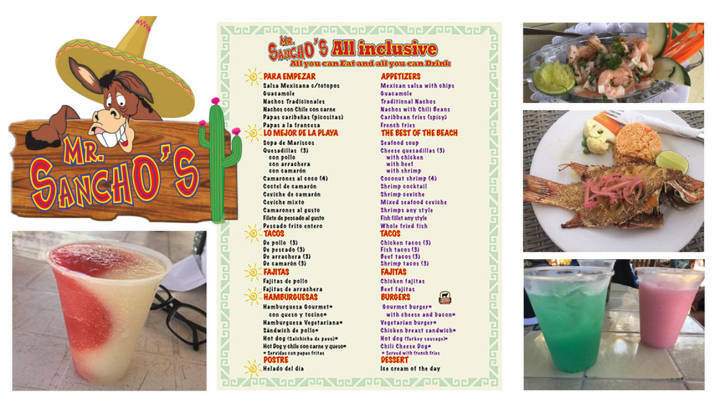 We hope these menus helped make your decision and that you have an amazing time in Cozumel. If you’d like to see how Mr Sanchos compares to the other resorts on the island, check out your eight other options on our post: Cozumel All Inclusive Day Pass Options.